Creators of Dynalon, the first certified superior performance fabric for dock seals and shelters. Dynalon outperforms any other fabric in today’s Dock Shelter market! 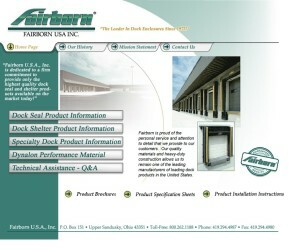 Fairborn U.S.A. is committed to the continued development of Dock Enclosures to suit our customer’s specific needs. Within the last few years, Fairborn has been granted ten (10) Patents on products that have proven to satisfy our customer’s requirements.